The new model at Legacy Falls is open daily at 620 Legacy Falls Drive South. CHAPEL HILL, N.C. – Jan. 22, 2019 – PRLog — If your new year’s resolution is to find a marvelous new home in one of the Triangle’s most desirable communities, look no further than the Legacy Falls neighborhood in Legacy at Jordan Lake! Developed by Freehold Communities, Legacy at Jordan Lake is a premier gated community of distinctive homes on 316 acres of rolling hills adjacent to picturesque Jordan Lake, just off Highway 64 in Chatham County. Trails, streams, an extensive amenities package, and lovely wooded homesites grace the property, as well as a spectacular waterfall cascading over a ledge 20+ feet in height at the community entrance. 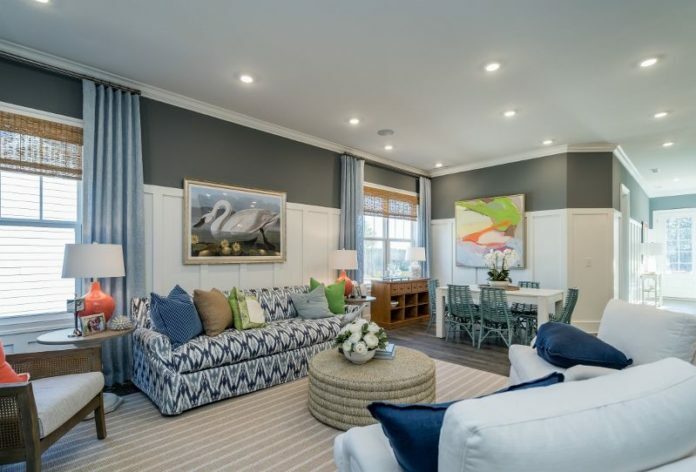 Legacy is quite simply a “must see,” offering vital and invigorating opportunities for those ready to raise a family, those ready to downsize, and those in between. Legacy Falls offers stunning homes of 2,763 – 4,418 square feet priced from the low $400s by award-winning M/I Homes. Whether you’re a chef seeking the ideal kitchen, a connoisseur of the good life searching for the perfect first-floor master, or a sports aficionado in need of a basement to host those rowdy Sunday football games, M/I Homes has a plan to fit your lifestyle. Tucked away in tranquil Legacy at Jordan Lake, Legacy Falls features privacy in the form of wooded yards and spacious homesites. Designed and built by award-winning M/I Homes, Hathaway II consists of 5 bedrooms and 4.5 baths in its ­­­­­3,481 square feet. An abundance of details makes Hathaway II a home you absolutely want to visit! A sampling of the first floor features include a covered front porch, a dining room made for entertaining, a fantastic gourmet kitchen that opens to a breakfast area and grand family room, a wonderful owner’s suite with a spa-like bath and tremendous walk-in closet, and a spacious laundry and an additional bedroom with a full bath. An inviting screened porch, a powder room, and a 2-car garage complete the first level. Upstairs is home to an expansive loft, walk-in storage galore, three roomy bedrooms, and a full bath. Hathaway II is third-party Energy Star certified, which means it delivers better quality, better comfort, and better durability when compared to other new homes. Also, Hathaway II, like all M/I homes, comes with a 15-year transferable structural warranty. As if all of this isn’t enough, M/I Homes is offering an amazing New Year New Home Event promotion to home buyers who close by March 29th. On Quick Move-In Homes*, the promotion offers buyers an amazing fixed rate mortgage below 3.99%, and a free washer/dryer, refrigerator, and blinds. On To-Be Built Homes*, the promotion offers a Free Smart Home Bundle, which includes automation touchscreen hub, mobile app and local control, smart door latch with keypad, smart thermostat, and video doorbell camera, plus up to $20,000 in designer upgrades, and $3,500 in paid closing costs. Now is certainly the time to buy! Give Earle a call for all of the details. In addition to Legacy Falls, M/I Homes also offers lovely new homes of 2,150 – 3,400 square feet priced from the mid $300s in Legacy Village at Legacy at Jordan Lake. Contact Earle today to learn more about Legacy at Jordan Lake and the current promotion – Call (919) 337-9710 or stop by the model, open daily, located at 620 Legacy Falls Drive South, Chapel Hill, NC. Don’t be surprised to find that your new year’s resolution has been granted almost effortlessly! We wish you the best in your new home and much ease with your other 2019 goals! Legacy at Jordan Lake is a premier gated community bordering picturesque Jordan Lake in Chatham County. Homeowners enjoy a Chapel Hill address just minutes from Raleigh, Research Triangle Park, and Durham, with excellent schools, employment centers, shopping, and restaurants all easily accessible. Trails and streams, a clubhouse, an extensive amenities package, and lovely wooded homesites grace this 316-acre property, with some homesites featuring horizon vistas and homes built by national builder M/I Homes. Roads have been designed to wind through the community’s natural ridges, giving the property a mountain-like feel, especially on ridge tops that feature magnificent panoramas of 15 – 20 miles. Visit legacyjordanlake.com to learn more. *On Quick Move In Homes – Valid on inventory contracts written between January 2, 2019, and January 31, 2019, and closed by March 29, 2019, during the New Year New Home Event. Discounts vary by product, home site and per community. Anything above and beyond promotional credit is buyer responsibility. Certain additional deposits may be required depending on the options selected. The interest rate is 3.875% with a 30-year Conventional fixed rate mortgage and a 10% down payment. The ANNUAL PERCENTAGE RATE IS 3.909% and is based on a sales price of $450,000 with a loan amount of $360,000. The program is available on select inventory homes only. Buyer must occupy the property and meet all qualification requirements of the program. The Seller’s contribution is limited to agency limits which depend on the loan program and LTV. Payments are based on a minimum 720 credit score. Buyer must make loan application within 48 hours of contract signing and must close by March 29, 2019. Advertised rate is for a limited time and subject to change without notice. Other financing programs may be available with as little as 3.5% down. Financing is offered through M/I Financial, LLC (NLMS# 50684). **Free Appliance Package includes standard washer, dryer, refrigerator and blinds. Offer good on new contracts written on or after 1/3/19 that close no later than 3/29/19. Some restrictions apply. Contact New Home Consultant for complete details. + Smart Home Bundle – Only applicable on To-Be-Built-Homes is subject to change without notice. See New Home Consultant for details. ++Up to $20,000 in Design Center Upgrades on contracts written on or after 1/3/19. Offer varies by community, plan and homesite. Offers subject to change without notice. Cannot be combined with any other offers. Some restrictions apply. See New Home Consultant for details. +++M/I Homes will pay up to $3500 in allowable closing costs (excluding prepaids, HOA dues and set up fees) on new To-Be-Built contracts written on or after 1/3/19. These closings costs will be paid on primary residence and 1st mortgages only and available through M/I Financial. The buyer must make application within 24 hours of contract. Some restrictions apply. See New Home Consultant for details.